Due to the Willamette Valley’s wet climate and high disease pressure, it is almost impossible to grow peaches and nectarines in the Willamette Valley without carefully timed fungicide applications. 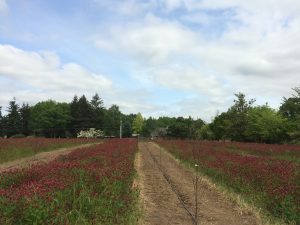 We set up a field trial of these species and will be looking at disease-resistant varieties to help manage the disease pressure existing in the Willamette Valley. The lab will evaluate survival and yield of cold-hardy varieties of almonds in western Oregon. Additionally, the lab will study if peach flowers are visited by native pollinators. Most almond varieties commonly grown for production in the United States are better adapted to arid conditions, typically found in the Sacramento and Central Valleys of California. 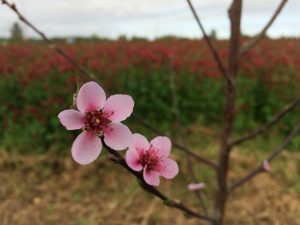 Some of the newly developed almond varieties can tolerate cooler, wetter environments. Several varieties of cold tolerant almonds have also been incorporated into the peach/nectarine plot, and we will evaluate their cold hardiness, yield and vigor in the years to come.